Apparently I have a problem. I don’t update my spices regularly enough! First case in point: cream of tartar. I have proof that it does not last forever, in case you were wondering. Today I have another example of my problem! Cayenne pepper. For months I’ve been thinking that we were out of cayenne pepper. Every time I’d go to use it I’d look around the cupboard, only to realize AGAIN that we were out. Well, I finally remembered to buy some last week. The next day I went to use it and, much to my surprise, I found TWO bottles of cayenne pepper in the cupboard! 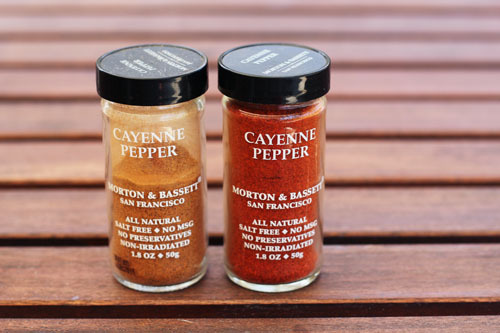 Only one of them didn’t look so much like cayenne pepper anymore. I find it funny that I actually picked the cayenne pepper up countless times looking for cayenne pepper but not even bothering to read the label because it looked nothing like cayenne pepper! I mean, it’s BROWN. So, I have a question for you today. Do you update your spices regularly? Do you have a good system for doing so? Or are you like me and forget about your spices until you actually need them and find they are totally useless?!?! If you happen to do a good job of keeping your spices up to date, please share tips, resources with info that you like, or anything you’ve got about keeping the spice cupboard fresh! If you buy in bulk (from penzeys or somewhere similar) then only put as much as you’ll use within the next six months in your “active” jar. Dry pack/can everything else in mason jars or mylar bags. I get 18 months out of this method easy, but I’ve never had spices stick around longer then that so I can’t say how long they will last. We have a family beach cabin that has been around since about 1910 … last summer, I was making a crab quiche and needed some garlic powder. Now, since this is a shared cabin among A LOT of family members, I typically just bring my own spices, since the age of anything in the cabin cupboards is very questionable. Anyway, I didn’t have any garlic powder, so I just used what I found. After we ate, I looked at the tin more closely and realized it had a McCormick copyright date of 1972! 1972!!! Now that makes all of your spices seem pretty fresh, doesn’t it?! Needless to say, I took it upon myself to purge the spice rack so no one else would make the same mistake! My mom did this recently and found spices that were from stores that had closed before I was born. I definitely don’t update mine through any method other than if they don’t look, taste, or smell like they should, I toss them. For someone who proclaims to be relatively organized, this is an area I do NOT excel at. Just a couple of days ago I was going through our spices to see if any were worth taking on our move across the country and found that multiple ones were expired. Like three years expired. Oh my embarrassing. Perhaps an email reminder would be a good thing. At least every year or so. I have one little trick that really helps. I bought those small round stickers called “garage sale labels” and every time I bring a new spice/seasoning home from the store, I stick one of those labels to the top of the jar. I write the date I purchased it right on top there so every time I take a spice out of the cupboard to use it, I see the label with the date right away (they are neon colored stickers, which helps!). I am able to quickly gauge their freshness; if they’re a year or less old, I’m good. If they’re up to 18 months old, I’ll still probably use it for that specific time but then write that spice on my grocery list and toss the remaining contents. Also, I just periodically go through our spice rack and check the dates on the labels to see what needs replacing. I’ve been doing this for a few years now and it totally helps. It’s not perfect, I’ve still come across labels that tell me I bought the spice in the jar a couple of years ago, but that is rare. I always feel kind of guilty throwing away most of a jar of spice that I never used up within the year, but spices don’t cost that much anyway and I’d rather have yummy food! p.s. some say to rotate spices every 6 months which is probably better, but I’ve found that a year is more reasonable for me and seems fine. I buy my spices in bulk from my local co-op! I found that it’s just easier that way. I buy what I need and if I want to try something out, I don’t have to commit to the whole bottle. I use my own containers, so it cuts down on waste. Some spices can be pretty pricey, so I never throw out. I actually sharpy the date right on the bottom or side as soon as I take it from grocery sack to cupboard. Works great! I only use a few spices… and I use them a lot! For anything special, I try to buy from either the spice shop downtown or at Whole Foods where you can measure the amount you want/need and just buy that amount. I do that with curry powder or spices that I haven’t tried and don’t know if I will love enough to commit to a full bottle on my small spice shelf. I keep a good stock of the basics (salt,pepper, crushed red pepper, cumin and italian seasoning) Since I do most of my shopping at a co-op I hit up the bulk bins and get only what I need for the week. It frees up a ton of space in the kitchen and cuts down big time at the register! Penzey’s Spices have really changed my way of cooking. I’m lucky to have a chest freezer with removable containers perfect for holding zip lock bags of spices. I’ve bought their empty containers for short term cupboard use that get re-filled as needed from the freezer stock. I believe the quality is much higher, the freshness much better, and I get a really great value buying in the bags and using short-term amounts in our cupboard. I’m also fairly OCD with our spice storage, 3 different areas; an alphabetzied drawer for cooking spices, an alphabetized area of a pull-out drawer/cabinet for baking spices, and a couple small IKEA hanging shelves that hold our most-used spices, including peppers, salts, and our own garden blends. also agree about the tip to use a small sticker to write dates on your spices. I also write the date purchased with a sharpie on the lid, works pretty well. if I notice something tasting a little off I can quickly reference the lid and see if age might be the culprit.